My Geeky Geeky Ways: The Dresden Files: Skin Game - A Spoiler-Free Review! The Dresden Files: Skin Game - A Spoiler-Free Review! Harry Dresden has had a bad year. And he's about to have a series of very bad days. Through the usual crazed alchemy that involves the trading of favors and obligations in the supernatural world, Harry has found his services traded away to one of his deadliest enemies - Nicodemus Archleone - in order to cover a debt owed by Queen Mab of the Winter Court. Soon Harry is standing among a veritable Legion of Doom of monsters, fallen angels, shape-shifters and warlocks united for one purpose - stealing from the vault of the Greek God Hades. Naturally, Dresden is sure there is more to this game than meets the eye. And while Nicodemus may need his help to pull off this heist, there's little chance that "old Nick" will let Harry or the rest of the crew walk away with their lives once the job is pulled. It will take all of Harry's cunning and power to get out of this one with mind, body and soul intact. For Hades is not known for his hospitality or mercy. And any who die in his realm may find themselves condemned to an ironic punishment for all eternity! At this point, there is little that can be said about Skin Game that would not be a colossal spoiler. Suffice it to say those who are new to the world of Harry Dresden should pick up Storm Front and begin working their way through the stories in order. While it was once possible to read the Dresden Files books out of order without worrying overly much, the series has progressed to a point where its rich history requires some basic knowledge of the world's progression as a whole. I can say this much. Long time fans of the series will find this entry satisfying. 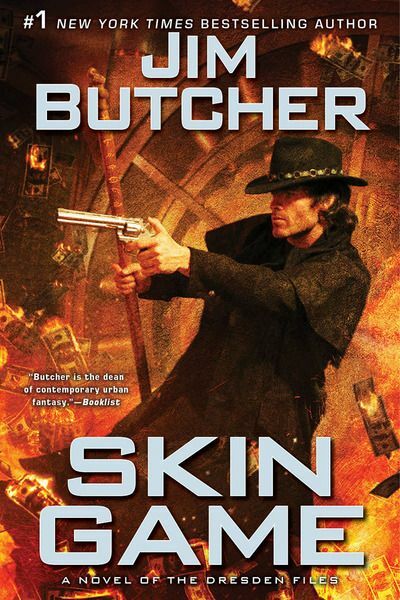 Jim Butcher does a fine job of adapting his characters into a heist story. And those who were disappointed at the number of cliff-hangers left open at the end of Cold Days will be glad to know that a large number of the series long-running subplots are resolved in Skin Game. That said, readers should expect to be surprised at least once as the novel progresses.